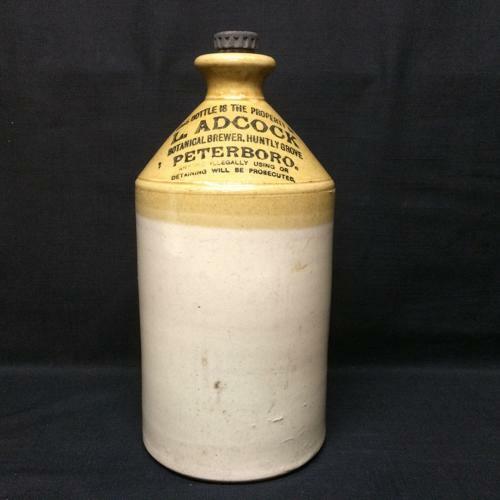 This is a wonderful English Victorian large stoneware bottle pot that once held Ginger Brew or Beer. The original recipe requires only ginger, sugar, water, lemon juice and a fungal-bacteria symbiote known as a ginger beer plant. Fermentation over a few days turns the mixture into ginger beer. Brewed ginger beer originated in Yorkshire in the mid-18th century. Botanical brewing is a simple process involving herbs and plant roots. The original recipe involved milling ginger roots before tumbling them into copper steam jacketed pans and leaving them to bubble and simmer releasing all their flavour. The finest herbs, natural flavourings, sugar, brewer's yeast and fresh spring water were then added to the liquid which was transferred into wooden vats where it was left to ferment. L Adcock was Leonard Adcock who moved to premises on Huntly Grove in 1911 with his wife Sarah where they brewed and sold Ginger Beer and Dandelion & Burdock in stone jars – the term “Botanical Brewer” signifies a brewer of non-alcoholic drinks. Sarah was very much the chief brewer whereas Leonard looked after the sales and delivery via the business’s single horse drawn dray. The lower image is almost certainly of Leonard at work ! Great Condition, complete with original screw style stopper.